As a parent do you ever wonder what your competition fees are paying for for your cheerleader or dancer? As a coach or director, do you want to provide the information to your parents but find it difficult to explain? This is a question that many parents around the world have. The parents do end up paying the fees but are left wondering what exactly they are paying for. We decided it may be helpful to give a run-down on the competition fee structure and what exactly you are getting for your money. Your child’s cheer gym, dance studio or high school must pay a fee to the event to register your child for competition. This fee may not be per team, but per team member or per routine entered. The event has to cover the cost of renting the facility, and we all know cheerleading and dance competition venues are rarely held at school gymnasiums anymore. The event producers must also pay their judges, which could consist of an estimated 20-30 judges working approximately 24 hours over the course of the event. The event in turn has their own staff to pay. They have staff working admission at the door, working behind the scenes at the event (coordinating the warm-up room, coordinating back-stage, etc. ), and in most cases, there are staff on the mat with your children as spotters. The event purchases trophies, banners, medals, team gifts, and more to ensure that winners are rewarded. And finally, the management of the event company needs to make a salary. After all, it may look very fun and exciting to run a cheer or dance event, but it takes hours of planning, preparation and execution! #2. Your child’s gym or dance studio. Just like the event managers who run cheerleading and dance competitions as their job, your child’s coaches and dance teachers, coach/direct as their job. Just like any other career (cashier, teacher, salesman, doctor, etc.) they are paid for their time at work. There are many hours put into registering dance routines and dancers, collecting and cutting music, organizing costumes and collecting funds from team members. When coaches are at a competition with your child, they are working and are paid accordingly, as well. As you know, competitions are rarely in the home town or city of your team. Coaches must get to the competition as well as have accommodations during their stay. Just like other jobs, coaches’ travel and accommodations are paid for while they are traveling for work. They also receive a meal stipend to pay for food while away for work. Many people assume that the competition fee, multiplied by the number of athletes attending the competition, is salary for the gym owner. This is far from the truth. Most gym owners and studio directors do not even take a salary for themselves while they are working at your child’s competition. So as you can see, those competition fees are spread around in so many different ways and are imperative to the success of your child’s experience while preparing for and attending competition. 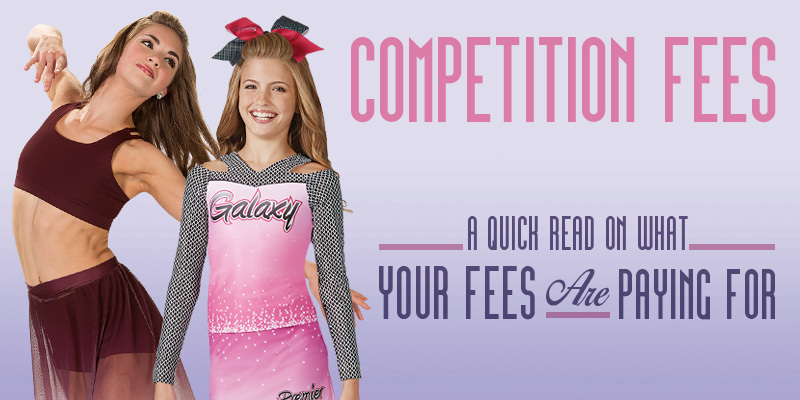 We hope this article sheds some light on the business of cheerleading and dance competitions and where exactly your competition fee is going.